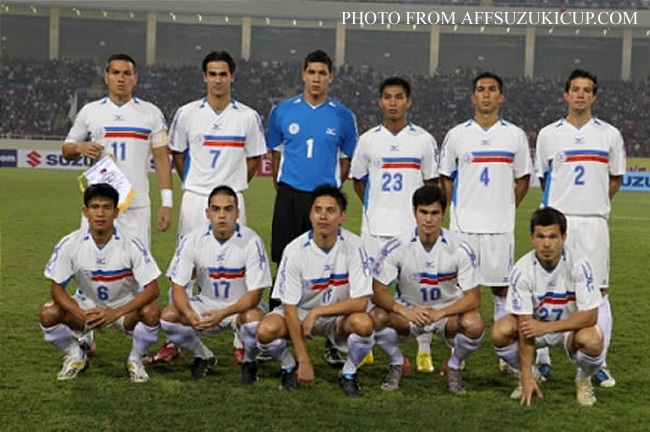 This morning, my thoughts heading into the final and decisive game of the Philippine National Football Team against Bangladesh in the AFC Challenge Cup Group A competition in Myanmar was that earthquakes seem to be hot on the trails of the Azkals. There was first a 7.2 magnitude quake when the team was in training camp north of Tokyo prior to the second leg of the Mongolia tie; and that infamous 8.9 magnitude killer just days after. Then there was this 6.8 shaker in Myanmar yesterday, forcing the whole team – it was reported – out of the hotel for safety reasons. If there was one earthquake that I really wanted to follow the team, it was one brought on by celebrations after – or so I hoped – the team had defeated Bangladesh in what was – to put things plain and simply – a must-win game. Of course, it was a little difficult to follow fortunes of the team in the tournament to begin with. 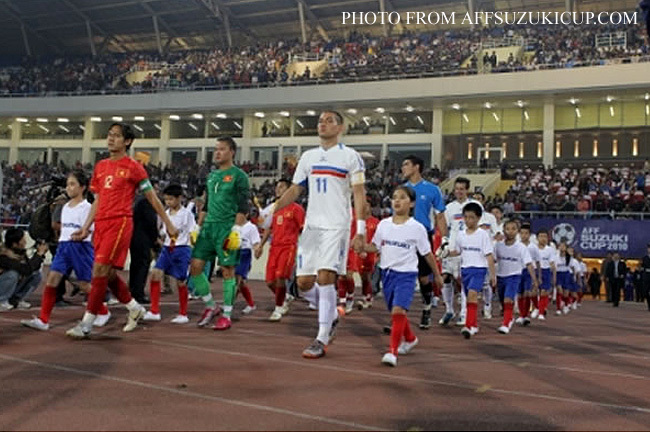 ABS-CBN and the Philippine Football Federation gave a press statement last week that stated that they were negotiating with the Government of Myanmar to beam the games live via satellite back to the Philippines. Regrettably – or so they said – by Friday night they had not heard from Myanmar. The department apparently in charge of approving such a request, the press statement said, had closed shop for the weekend. Not that there was anything to cheer about come Monday. As I belated learned from one of the many news web sites I follow, Myanmar – or so one report went – does not even allow such satellite feeds in the first place. To think that we Filipinos can sometimes go overboard in the way we criticize ourselves! At the very least, we can now bask in the knowledge that – unlike some countries that do not seem to have any desire to move into the twenty-first century – we can beam anything from news programs to football matches to hostage dramas to any country that cares to receive the live images. What is Myanmar, however, but a contradiction of its own self? To everyone’s surprise – staff and members of the team, sportscasters sent by their networks and fans that went at their own expenses – the country had access to the Internet! Albeit, the complaint that connection was painfully slow was also quite unanimous. So, therefore, I had no recourse but to follow the matches on Twitter. The lovely Diane Castillejo – bless her – was a goldmine of information! On paper, this elimination round was supposed to be a walk in the park for the Philippines – it was the highest ranked team in the competition. However, the FIFA rankings periodically released by the world federation are calculated based on matches played by national teams. It goes without saying that some fairly strong teams who play less matches will not place very highly in the list. 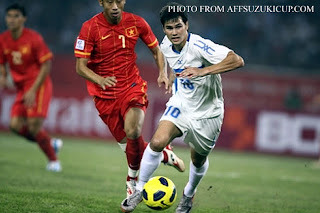 Myanmar, 10 points lower than the Philippines at 161, had already frustrated the Philippines to a 0-0 draw in the last AFF Suzuki Cup in Vietnam. Palestine, although a lowly 178, is a Middle Eastern team that would naturally have physically robust players. The Philippines had already lost goalscorer Phil Younghusband to a hamstring tear during the Ulan Bator leg of the Mongolia tie. The tear was significant enough to keep him out of the team – and, therefore, the Myanmar tournament – for at least four weeks. 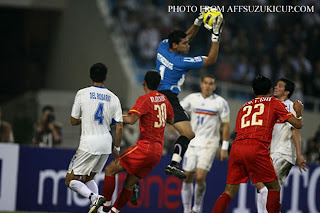 The loss of the goalscorer was tempered by news that a 6’ 3” Fil-Spanish striker by the name of Angel Guirado was ready to fill the void left by Younghusband’s injury; and that goalkeeper Neil Etheridge of Fulham FC and central defender Rob Gier were flying into Myanmar straight from the UK to reinforce the squad. Phil’s absence seemed of little consequence when his brother James slammed home a penalty in the 76th minute of the opening match against Myanmar to put the Philippines 1-nil ahead. Myanmar – or at least, so said the tweets – played well enough in the first half to have taken the lead; but the gods of football were on the side of the Philippines. That is, until the third minute of second half injury time when Myanmar scored from a freekick to level the match. 1-all was how the game ended. In the second game – no surprise – Palestine defeated Bangladesh 2-nil to head the table with 3 points; followed by the Philippines and Myanmar, both with one point. 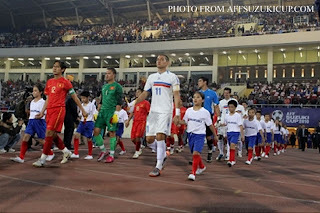 In the second round of matches played last Wednesday, the Philippines played Palestine to a goalless draw. The result was not received well by some fans here at home; personally, I thought the Palestine game was the trickiest of the lot and was happy with the draw. Bangladesh delivered the surprise of the tournament by defeating hosts Myanmar 2-nil courtesy of two lightning counterattacks. Had these two teams drawn their match, the Philippines would have sat at second place in the table behind Palestine with 2 points. Bangladesh’s surprise victory gave it three points; which meant that the only way for the Philippines to progress into the next stage was to defeat it. This was exactly what the Philippines did earlier today. The team led Bangladesh 1-nil in the first half courtesy of a shot from Ian Araneta that was deflected but somehow found its way into the net. Rather than sit back on its precious lead, the team continued to push forward in the second half. Its efforts were rewarded when, from a corner kick, Araneta headed to ball down into the path of Guirado who made no mistake with the shot to give the Azkals a two-goal cushion. The Filipinos continued with its lion share of possession, limiting Bangladesh to playing the long ball over the top. This the Filipinos dealt with effectively. As the game wound down to a close, Guirado capped his man-of-the-match performance with his second goal to put the Philippines ahead 3-nil. That was how the game ended. In the other match, Palestine put Myanmar out of its misery with a convincing 3-1 victory. The result means Palestine tops Group A with 7 points; followed by the Philippines with 5. Both countries qualify for the AFC Challenge Cup tournament proper to be played next year. 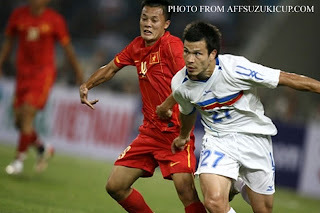 The others teams that have also qualified so far for the tournament proper are Asian Cup qualifier India and Turkmenistan from Group B; and the Maldives and Tajikistan from Group C. 2010 World Cup qualifier North Korea are almost certain to qualify as well from Group D.
The Philippines takes a break from international competition until June, when it starts its World Cup qualifying campaign. I used to think this sort of thing would never happen in my lifetime; yet now it is. We are with the big boys – and I am a happy man indeed!